So you think you may be pregnant, but you saw some small pink spots in your underwear when you went to the bathroom. You very well may wonder what it means. Light bleeding during early pregnancy, also called implantation bleeding, usually occurs 6 to 12 days after conception and is not dangerous or cause for concern. What causes implantation bleeding? Will it stop on its own? For anyone with these sorts of questions, FastMed Urgent Care has answers. FastMed is dedicated to providing quality medical care with compassion and has extended hours during the week, on weekends, and on holidays. Implantation Bleeding Is One of the Earliest Signs of Pregnancy. Implantation occurs after fertilization and is the attachment of a fertilized egg to the lining of the uterus. This attachment is what causes some women to bleed. It is estimated that 20-30% of women will have spotting at implantation and during early pregnancy. Now, how do I know it is implantation bleeding and not something else? Knowing what to look for is key. Take note of the quantity and color of the blood.Implantation bleeding usually causes just a small amount of pinkish-brown blood and typically lasts only a few days. Consider the timing. bleeding is often experienced 2-7 days before the beginning of your regular menstrual cycle. Will implantation bleeding go away on its own? Yes. If bleeding becomes worse or lasts for more than a few days, you may consider speaking with your healthcare provider. Does implantation bleeding mean I am definitely pregnant? Although implantation bleeding is a sign of pregnancy, the only way to know for sure is to take a pregnancy test. FastMed Urgent Care offers pregnancy tests and other services 7 days a week–with no appointment necessary. Our staff is knowledgable, friendly, and dedicated. Don’t believe us? 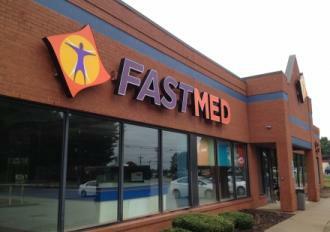 Gayle C., a FastMed patient, said, “The urgent care was terrific! The staff delivered exactly what I needed: professional care and personal attention.” Follow us on Twitter for more information!